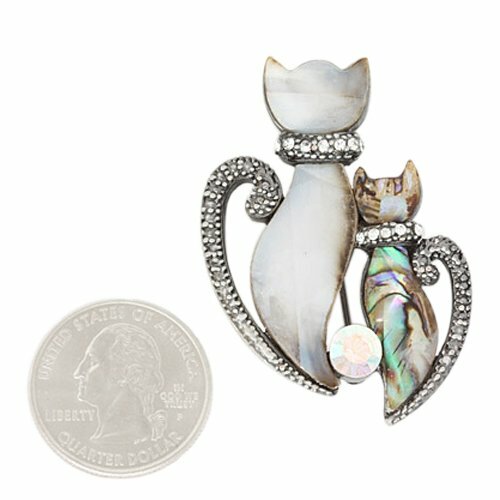 Here is an adorable rhinestone and abalone cat brooch. Pin measures approximately 1 1/3" X 1 3/4" and has two cuddly abalone cats with rhinestone collars and tails snuggling up to each other. You can wear it on a scarf, jacket, blouse, or anywhere! A perfect item for gift giving or for yourself, you will love it! This beautiful brooch pin comes to you in a foil gift box though may be a different box color than the one shown. Sale - Egyptian Bastet Bast Cat Jewelry Trinket Box - Ships Immediatly ! !